Coahuila based luchador in the indy scene where he often teams with Latino as Los Hermanos Diablos. 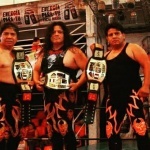 The group also features a number of other luchadores including his daughter Maligna. He is skilled at both sides as rudo and tecnico. His wrestling style is technique and high flying moves. He had trained his family members and has been promoter for benefit shows. This page was last edited on 26 February 2019, at 16:15.